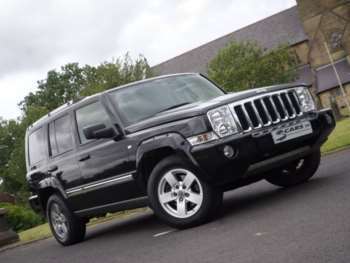 Introduced in 2006 the big, brick-shaped Commander was designed to take Jeep into the seven-seat 4x4 market which up to then had been dominated by the Land Rover Discovery and Volvo XC90. Based on the Grand Cherokee Platform it was launched with a choice of the 5.7-litre V8 hemi petrol engine or the Mercedes-sourced 4.0-litre V6 CRD diesel. All are five-speed automatics. The petrol model was dropped in 2007. All cars have Jeep's Quadra II four-wheel drive system with electronically controlled differentials that can keep you moving even if only one wheel has traction. The Commander ceased production in 2010. Chrysler only ever imported about 600 cars a year to the UK so there will always be a measure of exclusivity. The car comes in Predator or Limited trim and there's a luxury entertainment pack add-on which cost a hefty £3,000 when new. You get three rows of seats and the stepped roof means each is set a little higher than the last so everyone gets a decent view out. The middle row will comfortably accommodate six footers although the back row is best left to kids. All this is impressive given that the Commander is only a few inches longer than the Grand Cherokee. You don't get much luggage space with all the seats up but there's a respectable 36 cubic feet with the back row down and a huge 67.4 cubic feet with the middle row folded too. The heavy duty styling won't win any beauty contests but you can't deny that the Commander has presence. 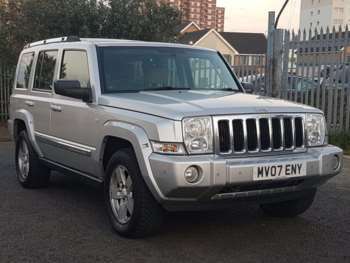 There aren't that many used Jeep Commander cars for sale about and they were often heavily discounted when new so they can be a bargain second hand. 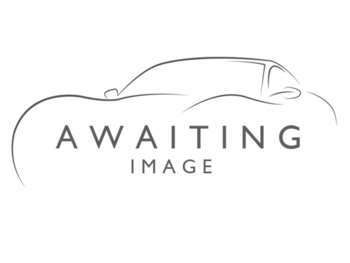 An early 06 plate Limited diesel with high mileage might just scrape under £6,000. A 57 plate V8 will be around £8,500 but a diesel will be perhaps £1,000 more. A late model diesel could be up to £15,000. Prices vary a lot, however, so be prepared to shop around and don't be afraid to haggle. Insurance groups are 14 to 16 which is not too bad but you'll pay a hefty annual wedge of VED even on diesels. These are tough vehicles with mechanicals that are shared with other Jeep models. Check for oil leaks and for worn rear shocks as there's a big overhang at the back. Wheels are susceptible to damage too. As with any 4x4 look for signs of serious off-roading. Most will never have tackled more than wet grass but they are capable off-roaders so it's important to inspect the underside for damage. There's a good dealer network so parts won't be hard to find but don't expect them to be cheap. A full exhaust, including cat, is around £700. A clutch is around £400 an alternator £300 and front brake pads about £40 a set. The Commander rides well on road and, perhaps surprisingly, handles quite well too. There's little roll through corners and electronic stability control keeps it from getting out of hand. It's reasonably quiet at motorway cruising speeds too. There's plenty of power from the 3.0-litre diesel and it'll return around 25mpg which is not bad for a car of this size. The V8 petrol is seriously quick at 7.4 seconds to 60mph but combine that with the square-rigged styling and you'll need deep pockets to finance the 18mpg thirst. If you want to use it off road there's no complex diff locking to worry about as there is in some rivals, a single lever engages low range and the electronics take care of the rest for you. If you're looking for a tow car the Commander has an impressive braked trailer weight of 3,360kg. Inside the seats are supportive with electric adjustments for the fronts. All three centre seats fold individually so you can have a six seater with a clear view down the centre of the car. 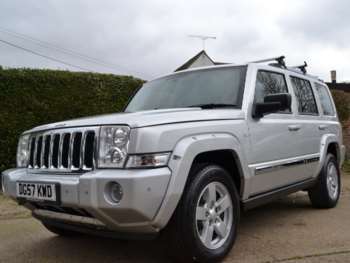 If you're looking for a seven-seat 4x4 then the used Jeep Commander may not be the first thing that comes to mind. But for the price of a basic Zafira it offers a much bigger car with far greater capabilities. The Commander is a serious piece of kit and if you can afford the running costs you won't regret buying one. 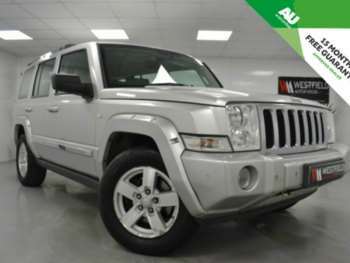 Got a specific Jeep Commander model in mind?